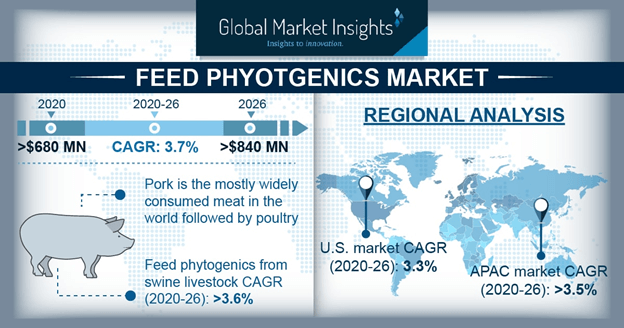 Feed Phytogenics Market size was over USD 600 million in 2017 and industry expects gains around 3.5% by 2024. Increasing per-capita meat consumption along with rising middle-class disposable income, particularly in China, India and Brazil, is likely to boost demand for livestock production application over the forecast period and increase feed phytogenics market size. China meat consumption surpassed over 50 kilograms per capita in 2017 which indicates ample market growth potential. These products are used to enhance the performance & health of various livestock animals including poultry, swine, ruminants and aquatic, primarily for meat consumption, which may further stimulate market growth. Increasing protein intake among health-conscious consumers along with prevailing malnutrition conditions, primarily in children has led to rising consumption of meat-based products in their diets. Over 150 million children under five years of age showed stunted growth owing to malnutrition in 2017. Moreover, consumers are switching to ready-to-eat processed meat products due to hectic lifestyles, increasing working population base and rising innovations in meat processing technology. These products help in dealing with growing prevalence of diseases such as Porcine Epidemic Diarrhea (PEDv), Bovine Spongiform Encephalopathy (BSE), and bird flu, which may promote the growth of the market. Phytogenics compounds in animal feed additives may include certain side effects such as unpleasant taste/odour or toxicity, regulatory concerns and possible interactions with other feed ingredients. It is difficult to conduct comprehensive and systematic evaluations towards efficacy and safety of these compounds owing to complex composition which may restrain the growth of feed phytogenics market size. Global essential oils feed phytogenics market may experience a demand of over USD 380 million by 2024. They are mainly used for enhancing animal’s performance, primarily in ruminants, where they reduce ammonia production by ruminal microbes and increases protein content. Moreover, these products increase the concentration of amylase and other endogenous enzymes thereby regulating the gut microbial flora and promoting product demand. Oleoresins feed phytogenics market demand may witness gains at over 3% by the end of 2024. Dietary supplementation with carvacrol, cinnamaldehyde and capsicum oleoresin shows improvement in production performance and the concentration of anti-oxidants in the liver of broilers. Feed supplementation with thymol combined with carvacrol also enhances performance, increases antioxidant enzymes activity, enhances digestive enzymes activity and improves immune response in broilers. Moreover, these products impart several beneficial biological properties such as antibacterial, antifungal, antioxidant and anti-inflammatory effects, which may stimulate market growth. Feed phytogenics Industry size from poultry may witness growth of about 3% over the forecasted timeframe. There is an increase in organic and safe poultry meat demand which has led to a rise in broiler producers seeking high density diets to feed their stocks and seek highest possible profitability. These products regulate gut microflora which directly improves nutrient digestibility and limits the growth of pathogenic bacteria in the gut, thus accelerating product demand. Feed phytogenics market from ruminant applications was valued at over USD 120 million in 2017. These products find usage in dairy cow nutrition to enhance the technical properties of milk for cheese and butter production and play a critical role in responding to a ruminant’s complex digestive & metabolic system. These products directly support the gastrointestinal tract by imparting anti-inflammatory and anti-oxidative properties, which is essential for the survival of calves and may boost industry growth. Feed phytogenics market from equine may witness growth of approximately 3% in the forecasted timeframe. These products improve athletic performance, delay fatigue and help in reducing injuries in performance horses. These products help in treating various stress and related diseases which is a growing concern amongst horse owners, breeders, & riders and their use do not entail major hazards as for antibiotics, which may stimulate product demand. North America, driven by Canada and U.S. market size may surpass USD 120 million by 2024. Recent trend towards reduction of AGPs in the region particularly for poultry livestock applications has influenced the industry to look for viable alternatives, thus promoting natural growth promoters (NGPs). These products are of natural origin, enhance the gut health and improve metabolism & performance, thereby reducing the incidence of drug resistant superbugs in humans and accelerating the market growth. Europe market demand driven by Germany, UK, France, Italy and Netherlands may register gains close to 3% in the forecasted timeframe. This region is witnessing a reduction in antibiotics usage as growth promoters in animal feed additives by EU government owing to resistance development issues. Moreover, these regions are promoting usage of natural additives, particularly plant extracts which provide significant use to livestock farmers by reducing feed costs as they improve digestion and enhance nutrition utilization in animals, thereby stimulating growth of phytogenic feed additives market size. Asia Pacific driven by India, Japan, China market size may register significant gains at over 3.5% by the end of foreseeable timeframe. The region is witnessing a rise in livestock production for meat consumption coupled with increasing per capita disposable income. Growing awareness regarding feed additive benefits among livestock farmers coupled with recent outbreak of diseases may promote regional growth. 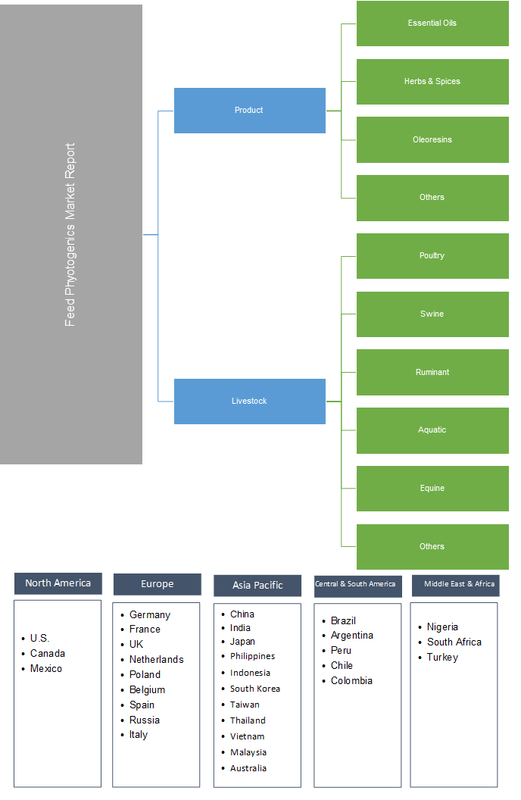 Global feed phytogenics industry share is competitive and fragmented among various market participants such as DuPont Danisco, Synthite Industries, Doterra, The Himalaya Drug Company, Biomin Holding GmbH, Dodson and Horrell. Prominent manufacturers are focusing on strategic acquisitions to expand their product portfolio & achieve technological advancement and strategic agreements to expand their distribution network and achieve market growth. Feed phytogenics are products of plant origin such as herbs & spices and essential oils used in livestock production as non-nutrient substances to enhance their performance & health. Potential benefits offered by these products include, increased feed intake, digestion stimulation, increased growth performance, reduced diarrhoea prevalence, improvement in reproductive system and feed efficiency. Growing prevalence of diseases, rising consumption of meat and increasing regulations on the usage of antibiotics in animal feed may accelerate growth of phytogenic feed additives market size.